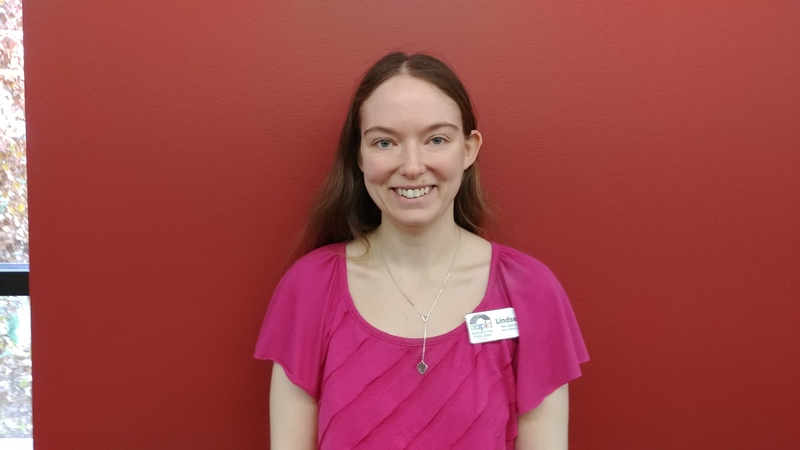 NEW YORK – Today Lindsey Tomsu, teen librarian at the Algonquin (Illinois) Area Public Library District, was named a winner of this year’s I Love My Librarian Award. Tomsu is recognized for her leadership in transforming lives and communities through education and lifelong learning. She is one of only 10 librarians in the country this year to receive this national honor. Tomsu is commended for her work at the Algonquin Area Public Library District and previously, La Vista (Nebraska) Public Library. She was nominated by a variety of students from both libraries’ TAB (Teen Advisory Boards) who commended Tomsu’s efforts to make teens’ voices heard. She has provided a welcoming atmosphere for her young patrons, serving as a friend, mentor and older sister. She encourages teens to take ownership of the library and to never see any idea as impossible. She has helped bring to life programs ranging from the unusual – Bacon Club and Pool Noodle Kendo Club – to the technological – Media Club and a Teen Makerspace. Among the community programs she developed was the BUILD Collective, a multi-purpose program that allows teens and tweens to play with educational toys that foster their imagination and creativity. Tomsu will receive a $5,000 prize at an award ceremony and reception to be held this evening in New York City. The ceremony is hosted by Carnegie Corporation of New York, which co-sponsors the award along with The New York Public Library and The New York Times. The American Library Association administers the award through its Communications and Marketing Office, which promotes the value of libraries and librarians.